The close of the summer season has come and gone, but that does not mean that Niagara Falls, USA will run out of options for travelers and guests. Fall is one of the best times of the year to come to the city, and the Red Coach is the perfect venue to stay at! The Red Coach is located just 500 yards from the American Falls and right across the street from the Cave of the Winds on Goat Island and the Maid of the Mist at Niagara Reservation State Park. Located close by are the Aquarium of Niagara, Arrowhead Spring Vineyards Niagara Wine Trail, Castellani Art Museum, and Devil’s Hole State Park. After a day of sightseeing we encourage you to have a wonderful dinner at our restaurant, and enjoy our diverse wine list, featuring vintages from the Niagara region. Call us at 716-282-1459 to book your room today. You may know about the world famous Red Coach Inn and Restaurant...but here is something you may not know.... The location of The Red Coach Inn is perfectly suited for your wedding reception! We offer the bride and groom a luxurious suite overlooking the spectacular Upper Rapids of Niagara Falls USA, the honeymoon capital of the world. All accommodations include such amenities as a whirlpool tub, and Gilchrist & Soames bath items from England. For those added special touches to make your honeymoon unforgettable, choose from our romance packages to include roses, champagne, chocolates, and more. Your bridal party, family, and friends can also stay with us, and we can host your rehearsal dinner as well. Our banquet room seats 50, and the menu selections include everything from prime rib to veal to seafood. For a less formal affair, you can choose from our buffet selections. There are also separate hors d’oeuvres and cocktail menus. 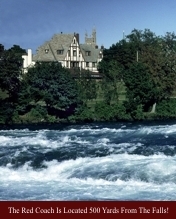 It's the perfect place for your wedding in Niagara Falls, New York.